How did a Sardinian folksinger by the name of Gavino De Lunas end up murdered by the Nazis in Rome’s Ardeatine Caves 70 years ago — the most notorious Nazi atrocity in WW2 Italy? Here’s my March 21, 2014 story about it in Tablet Magazine. In December, I visited a woman named Barbara Cole, who lives part-time near the small town of Todi, in central Italy. Over lunch, she told stories about her family and especially about her grandfather, a colorful Sardinian folk hero whose life history she has been piecing together from family documents and other sources. Cole’s father was a British airman who met her mother, a local beauty queen, while he was stationed in Sardinia after World War II. Cole herself was raised in England and has only begun exploring her Sardinian heritage in recent years. Her mother’s father, she told me, had been a well-known Sardinian poet and folk singer named Gavino Luna, who had gone by the stage name Gavino De Lunas. Though little-known outside Sardinia, he was famous on the island, especially in his hometown of Padria. 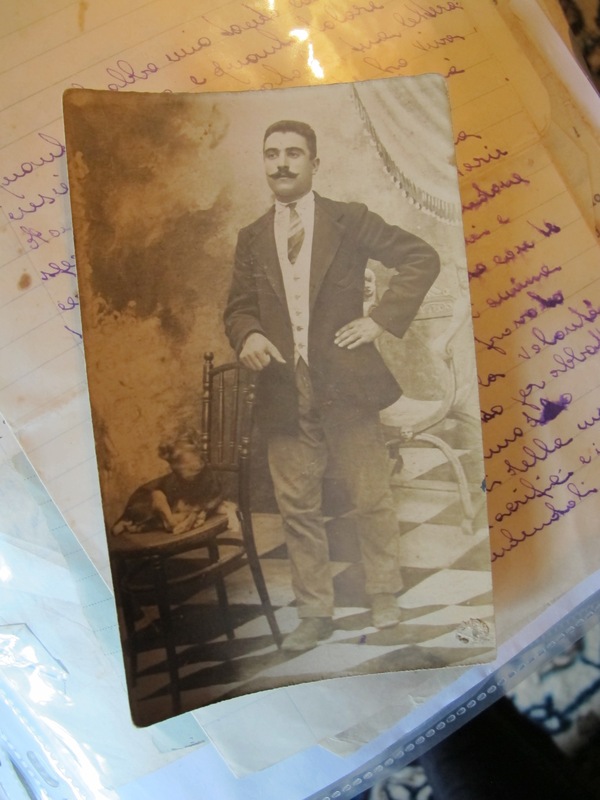 Gavino cut records, played guitar, was photographed wearing traditional Sardinian folk costume—complete with tasseled hat—and published his lyrics in print. As a day job, he worked for the Italian postal service, based in post offices in Cagliari, L’Aquila, and Rome. He was wounded fighting for Italy in World War I, and during World War II he worked in Rome for the underground anti-Fascist resistance. In early 1944, Gavino was employed at the main post office in Rome, but he also secretly helped carry out acts of sabotage—such as cutting phone lines and laying explosives. “He had great passion and hated that the Germans were taking over his country,” Cole told me.